The most important aspect of any Jewellery Valuation for Insurance is the detail and accuracy of the description (and the colour photo). This, rather than the dollar value, is your real protection. GemLab’s professional gemologists and valuers will document your precious items to make it easier for you to get a fast and fair settlement from your insurance company. 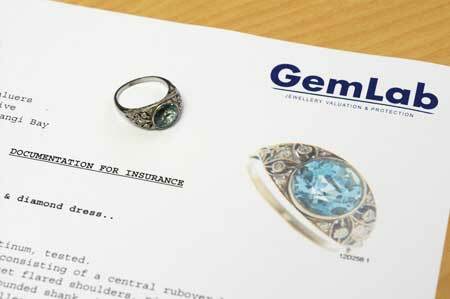 So that you only pay for what needs to be done, GemLab can tailor your jewellery documentation to your insurance policy. Secure copies will also be held on your behalf indefinitely. How Much Does GemLab Insurance Documentation Cost? Items that need to be specified on your insurance policy, or are over $3000 replacement new value — These require our full valuation report. You may also want to include items of special value to you personally. Items that do not need to be specified — Our Inventory Report will offer the protection these need. Costume & low value items — We provide a free photo so that all your jewellery has a record of some kind. * Only applies to low value items in conjunction with other reports being done. Why should my jewellery be documented and valued? Two reasons. So that your jewellery can be listed separately on your Contents Insurance Policy if necessary. And at claim time the valuations provide proof you had the item, and evidence of its value. Why are some items listed separately on my policy? Most policies have limits for jewellery items that are not listed, usually a figure between $1000 and $3000 for each, but some are as low as $500. There is also usually a total limit for each claim of between $3000 and $20,000 irrespective of the number of unlisted items in the claim. What does an effective insurance valuation of my jewellery look like? It is a document that contains a good colour photo, a detailed enough description to allow a current value to be calculated without re-examination of your items, and a value or values for each that represent the amount the item should be covered for under the terms of the Policy. Ideally the valuer should not be the seller, or have any other financial interest in the items. If the seller provides a valuation it must disclose that they sold it, and the amount you paid for it. An independent jewellery valuer should be able to accurately identify the gems and metals and provide a good description of their dimensions, weights, and quality. The valuer would ideally be a qualified gemologist and diamond grader but this is not essential as long as they have access to someone who is. Most importantly your jewellery valuer should have a good understanding of the basic valuation principles, methodologies, and ethics that apply to the valuation of any form of property. What types of value are listed on an insurance valuation? There are two ways your jewellery may be covered by your policy, which is why many valuations list two insurance values. One is the Replacement New Value which is the amount necessary for you to purchase a brand new item of equivalent quality. The other is the Indemnity Value—more recently referred to by insurance companies as “market value”, “present day value” and “current value”—this is the amount necessary to purchase an item of similar quality age and condition—ie the secondhand retail value. What happens when I lose the item and file a claim? The Insurance Company will require some proof of ownership, and evidence of the value of the item. Once the claim is accepted, the current value or values will be recalculated from the item description in your valuation. If your cover is for Replacement, you will usually be issued with a voucher to purchase a new item. If your cover is for Indemnity the insurance company usually has the option of replacing as above, or paying you the Indemnity value in cash.